Ready to Do Your Own Japanese Beetle Control and Removal? What do we usually say? All the best stuff is made is Japan! The japanese beetle is no exception. He is the best looking beetle I know with its flashy green body and bronzed colored wings. Quite unmistakable, while at the same time it makes me think it's more dirty looking than most bugs, especially during their grub (larvae) stage when they are white, brown headed and C-shaped looking worms. de-coloration (yellow) on leaves and other vegetation. Since they love the warmer months of the year, you can expect them to around and hard at work until temperatures start cooling down. How often do you keep your soil damp? Eggs need wet soil to hatch, that is why the adults find their way into your lawn if you keep it drenched, they will lay their eggs and the young will in turn in the roots in your soil. Controlling the amount of water you put in your soil is extremely important. Deep irrigation and combined with infrequency will result in a healthy lawn, plants, crops, etc. Develop your own system to focus on minimizing the amount of time your soil stays damp. One of the cheapest and easiest ways of getting the japanese beetle away from your soil is by plastic garlic, hot peppers, or geranium in your garden. Judge your situation to determine the amount of these that need to be planted. The Milky Spore Disease, for grubs only. You can buy the disease spore powder from a local garden store. After applying the spores very lightly water your garden, this will make sure the powder sinks into the soil. Also, make sure you read the labels for product-specific instructions and for safety, but no matter which brand you pick always wear a mask. Hand picking japanese beetle is real simple to do but can be time consuming depending on the severity of the infestation. Since this beetle starts to eat at the beginning of the day (day feeders) you can pick at time that is best for you but come prepared with a bucket of soapy water. You'll use the bucket to kill these little critters. Pluck and drop them in the bucket, be thorough and be patient, this method is recommended by most people who have had great success in controlling the japanese beetle. I know that a quick search the strongest chemical to kill the japanese beetle will return many results, leaving you without an option. The easiest way to go about killing bugs with chemical is to keep in mind the other bugs that are also going to die as well. Your biggest concern is the their natural predator, like wasps, spiders and even birds, like starlings. So, choose wisely. Here are some solutions that will not kill their natural predators. Pyrethrum products. Also knows as pyrethroid-based products will be very effective almost as soon as you spray them on adults. Neem Oil. 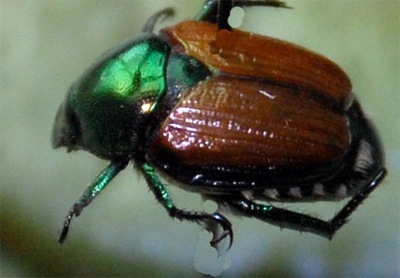 This chemical oil spray is supposed to be applied on leaves, since they are this beetle's favorite meal. 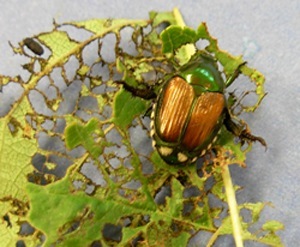 Remember that you have two tasks at hand you must control the adult japanese beetle, which can come from anywhere, and the grubs, which live underground, in your soil. Use a combination of the methods described above according to the severity of your problem for best results. Click here to learn how to get rid of the weevil and how to identify it. These are easily controlled simple home up keeping and buzz zappers. Again, good up-keeping of the home is key, here's why..